Joaquín Blanco (RCNGC), Alison Young (British sailing team) and Alfonso Fernández (RCN Tenerife) took the three golds in the Laser class in the International Gran Canaria Trophy (Trofeo Isla de Gran Canaria), which finished today in the bay of Las Palmas de Gran Canaria. RCNGC sailor Luis Cabrera won the gold in the men’s Radial and Carlota Sánchez took the gold in the women’s Laser 4.7. Blanco, member of the Spanish Pre-Olympic team, had a tough win over fellow RCNGC sailor and world youth champion Joel Rodríguez, sewing up a championship that didn’t get off to a great start for him. This is Blanco’s third gold in a row in just over a month, after his wins at the 16th Semana Olímpica Canaria de Vela and the Palamós Christmas Race. 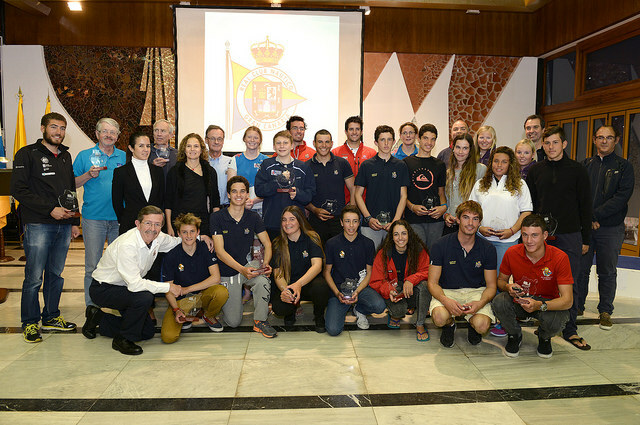 During the award ceremony, held this afternoon and attended by City Councillor Mimi González (Ciudad de Mar) and the president of the Canary Islands Sailing Federation, Joaquín Blanco, RCNGC president Óscar Bergasa commented on the presence of 12 boats in the 2.4mR Paralympic class, saying that, in his opinion, this consolidates the club’s support for disabled sailing. 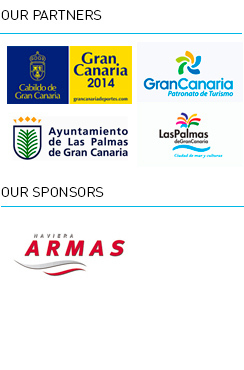 Representatives from 16 countries took part in the international regatta, the third event of the Gran Canaria Sail in Winter programme, organised by Real Club Náutico de Gran Canaria with the support of the Gran Canaria Cabildo and Las Palmas de Gran Canaria City Hall. The third and final day of competition started as expected, with 10-12 knot winds and a heavy swell, but as the day wore on the winds shifted from northeast to southeast. The drop in the wind intensity meant all scheduled races could be held. Joel Rodríguez, who fought until the final day for first place in Laser Standard and ended up with the silver, said his result was “very positive”. At the end of the race he said that the most important thing was to take advantage of the chance to train with top sailors. His next event is the Regata de Carnaval, in Las Palmas de Gran Canaria, the final race in the Gran Canaria Sail in Winter programme and the first in the Laser Europa Cup series. Just a few days later, he’ll be sailing in the Semana Olímpica Andaluza, the second race that counts towards the Spanish Pre-Olympic team after the Canary Islands Olympic Sailing Week. The gold in Laser Radial was for British Olympic sailor Alison Young, who came fifth in London in 2012. She had a poor start in the Canary Islands event but came through on the second and third days, taking first place. RCNGC sailor Luis Cabrera, silver in the overall Laser Radial and gold in the men’s, said “I knew I had a chance, but I knew I had some tough competition as well”. Cabrera mentioned the importance of the wind shifts during the race and was positive about his results as he looks forward to his next race, at the Canary Islands Radial championship, in Tenerife. Alfonso Fernández, from Tenerife, took the gold in Laser 4.7, a class initially led by RCNGC sailor Patricia Reino. As expected, Sweden’s Hans Asklund won in the 2.4mR Paralympic class, with five firsts in the eight races held. The first Spanish competitor was Pablo García, in seventh place. The crew of Nahuel Rodríguez (RCNGC) and Nicolás Rodríguez (RCN Vigo) won the gold in 470, a class with few competitors at this event. In Techno (boards), the victory went to Britain’s Joshua Carey. Magüi Suárez (RCNGC), the top Spanish Techno competitor and the only girl in this class, took the silver.